The Hotel Normandie in Koreatown is now host to Cassell’s Restaurant—a hamburger joint that has been around since 1948. It opened in this location in December 2014 and brings a touch of new to the Hotel Normandie (despite all of the old signs on the wall brought from the previous location). The atmosphere is very lively, albeit a bit noisy since the tables are very close together, but the staff couldn’t be more welcoming and I for one look forward to returning. The menu is fairly simple and straightforward, and if you go for a simple hamburger or cheeseburger, you will be extremely satisfied. The beef comes from Aspen and yes, it is grass fed and is Angus chuck—and the buns from La Brea Bakery really nail it. The Chef in charge is Christian Page who has been bestowed with the task of maintaining the Cassell’s reputation which started in 1948 by Al Cassell who specialized in fresh meat grinding and is credited with the homemade sides such as the world famous potato salad, chips and cole slaw. Chef Page likes to make it perfectly clear that he did not re-create the 1948 Cassel’s, but did in fact bring it back to life and has re-ignited the care and effort that Al Cassell took as its founder. 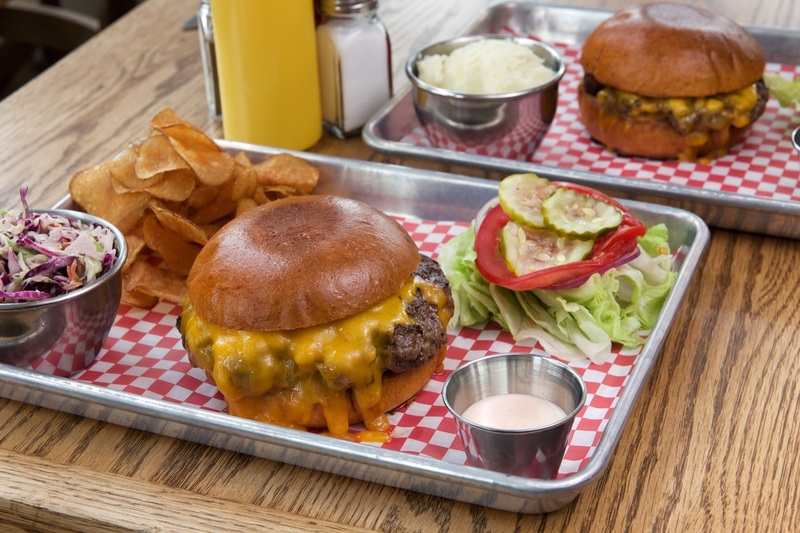 Even though the crowd seemed to be of the younger ilk, many old-timers who missed Cassell’s specialty burgers have found their way to the new space, and unless the loud classic rock has put them off, they should be back for more. The Cross Fire Broiled Burger has Thousand Island dressing, lettuce, tomato, onions and pickles and you can add bacon or fried egg if you wish. The Cheeseburger is equally as popular if not more so, and they also have a Burger Patty minus the bun, and a Patty Melt with cheese served on toasted rye bread. Cassell’s also has a full bar and their in-house English mixologist is actively building up their cocktail menu. He has selected some creative base spirits such as Luksusowa vodka, Union Mezcal, Bulliet rye, Fords gin, Evan Williams bourbon and Matusalem rum. Milk Shakes are also a big deal here and they use only McConnell’s ice cream from the prestigious Santa Barbara venue. The flavors include chocolate and vanilla, as well as a seasonal version. The pies are also noteworthy, in particular, the lemon meringue.